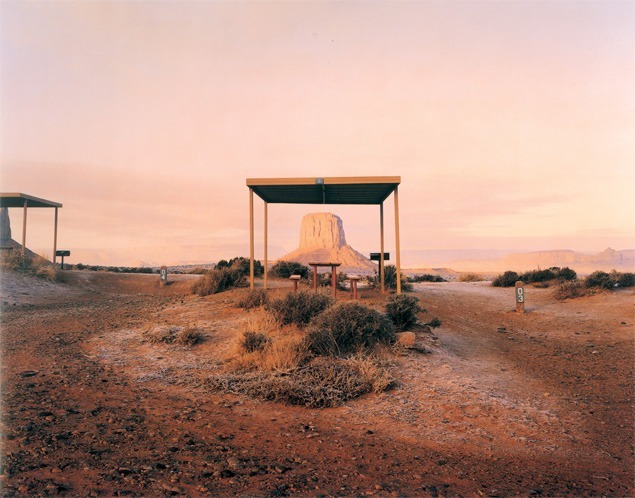 Terry Falke’s body of wry, lyrical photographs forms an intimate and idiosyncratic portrait of the American Southwest. By emphasizing the unique beauty of the region’s landscape, Falke makes the incongruous and sometimes amusing artifacts of human presence more apparent. With a sense of humor and a unique ability to craft acute cultural and visual connections, his work reveals a paradise altered by human behavior. As personal as they are provocative, the large-formats photographs of Observations in an Occupied Wilderness are the record of Falke’s unique experience of the place he calls home. Both revering to and subverting the grand tradition of Western landscape photography, these images bear a critical yet devoted approach to the places the artist photographs. By placing his camera in a specific location and carefully choosing what information gets included and excluded from the shot, Falke suggests new relationships between the elements in the scene. The roads, trails, shelters and other human imprints that pervade these photographs are so often constructed to enhance human experience of the landscape, but, through Falke’s insistent eye, we see that that which “improves” our experience of nature can also disconnect us from it.